CCOT has designed and built a super heavy duty 1-1/2" & 2-1/2" "Hell for Stout" lift shackle exclusively for FJ40, FJ60 and FJ62s. These Shackles are made by CCOT and available only at CCOT. 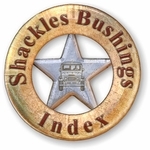 CCOT's HFS™ Shackles are the strongest "H" pattern (style) Shackles in the Land Cruiser Market. Shackles are built from 3/8" thick side plates with a precision welded "C" channel for superior strength. Shackles are yellow zinc plated and come complete with Heavy Duty 18mm Cross Bolts (OEM Diameter) with Washers and "nylock" Nuts. 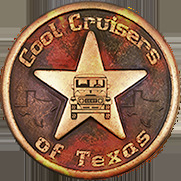 Shackles make a quick and inexpensive cure to slightly raise your FJ40, FJ60 or FJ62 for greater clearance. Combine CCOT's 1-1/2" or 2-1/2" "Hell for Stout" Shackles with CCOT's heavy duty HFS™ Lift Springs (see below) and raise your Cruiser approximately 2.5" to 3.5"s. This combination looks very strong with larger tires. 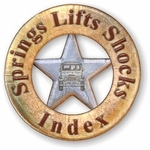 Barbell Shackles fit Toyota Springs, HFS™ Springs as well as many other popular Springs with stock size Spring eyes. Do not over tighten to bend side plates.